I seem to send a lot of clothes I’ve noticed. They pack well and I hope that they fit. I may need to look into some more ideas as to what to send. 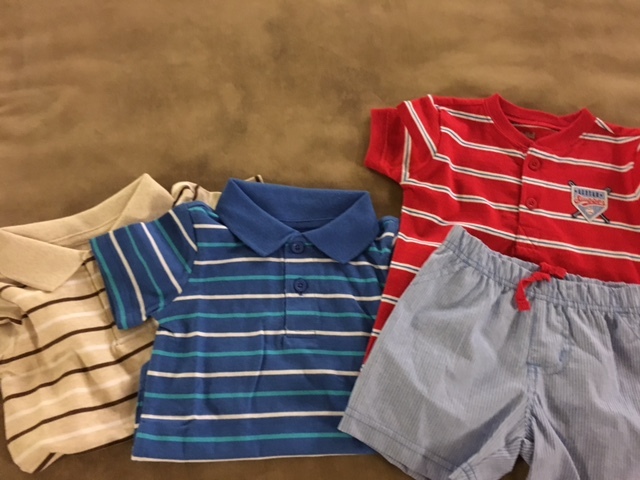 But I’m hoping he will look super handsome in these shirts and little shorts. 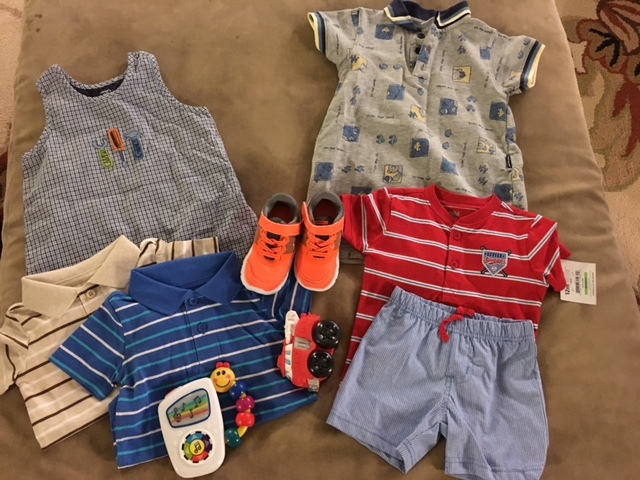 I also sent these little outfits. 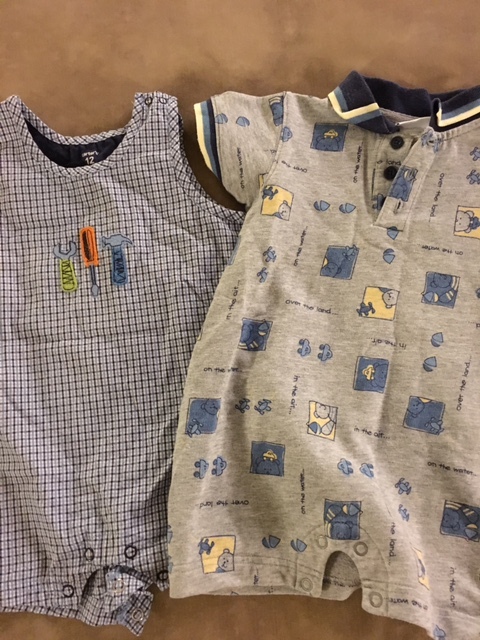 Both Caedmon and Leighton wore them when they were 1 and I have a number of photos of them in them. I need to remember to include a memory stick with a package so that the foster family can take photos and put them on there for us down the road. I hope he likes trucks as much as his brothers do. These trucks are fairly indestructible and pack well in a baggie to send. 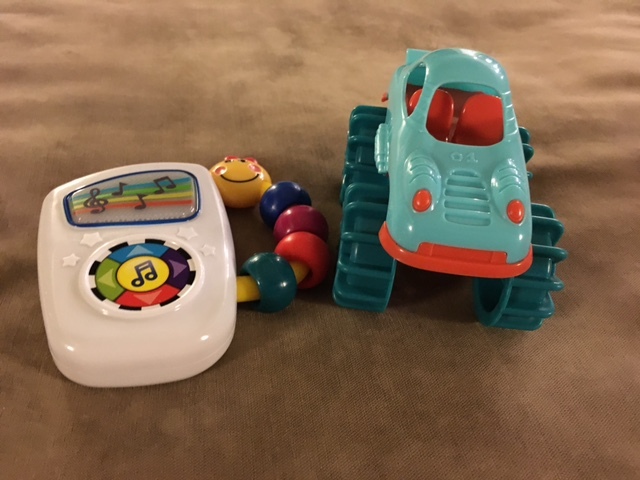 I also found this little music playing thing that plays all sorts of different little tunes. Hopefully it doesn’t sing and play in someone’s suitcase all the way to Korea. 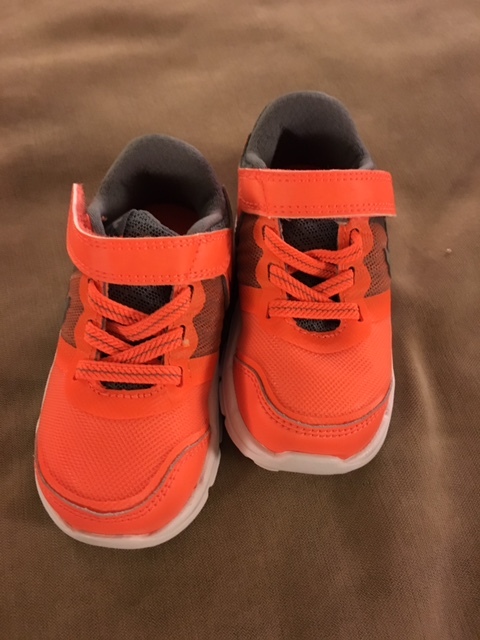 We were given these shoes for Edric just before he came home from some dear friends. I was bummed to discover that while the rest of Edric is a small peanut he has giant feet and these were too small for him. When our agency traveled to Korea in June they traced Paxton’s foot for us and it appears that these will fit. I think they are so cute and I hope I get to see a photo of him wearing them. Everyone will be able to see him coming in these bright shoes. And that’s package #6. So thankful for all the families that travel and take the little tokens of our love over the ocean to our little ones. It may be all be to help me feel better during the wait, but I hope that it helps start building the bridge between us. Previous Post A Different Process….